A pest technician working in his first year in the industry says he is relishing the chance to add more to his knowledge and skills after he became the 5,000th person to join the BASIS PROMPT register. 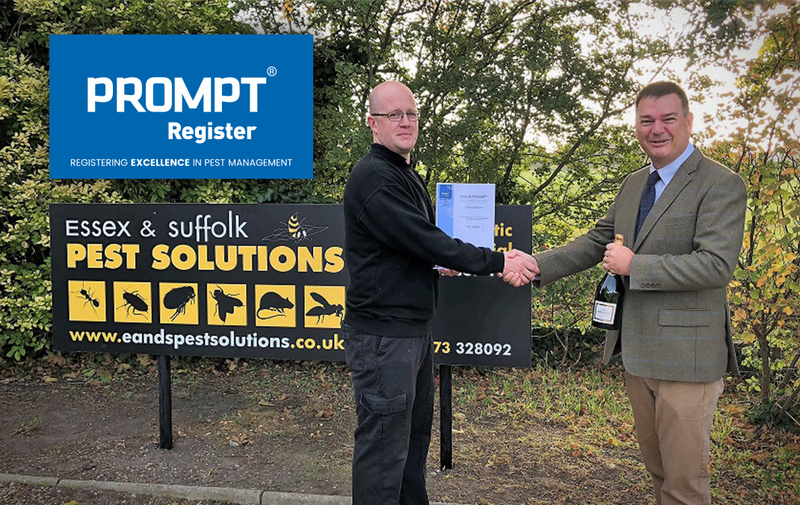 Steve Wilson, who works for Essex and Suffolk Pest Solutions, based in Ipswich, has been presented with a bottle of champagne by Stephen Jacob, chief executive of BASIS PROMPT, to celebrate the register reaching the landmark figure last week. The register was established 17 years ago and is backed by the Government and a host of leading organisations from across the pest management industry. Not only does it help its members to access courses and learning opportunities, it provides independent proof that they are trained and are constantly updating their CPD. Steve, 38, joined the industry last year after spending 16 years in railway engineering but deciding to switch careers because he was increasingly having to spend time away from his family. He has not looked back since and says that among the highlights of his first year was an extremely busy summer dealing with wasps and the satisfaction of helping people with pest infestation problems. He said: “This job is very different to what I did before, but I am really enjoying myself and no two days are ever the same. “The most surprising thing I learned during the year was that no-one is immune from having a pest problem, and for some people with animal phobias it’s a real problem, so a lot of my time has been talking to them about what we’re doing and giving advice on proofing their homes. Essex and Suffolk Pest Solutions is based in Ipswich and is a family run business which has three technicians on the books, all of whom are signed up to the BASIS PROMPT register. As well as receiving a bottle of champagne, Steve has also been invited to dine with the BASIS PROMPT team at the forthcoming NPTA’s PestTech 2018 event in Milton Keynes next month. Mr Jacob said: “Reaching 5,000 members is a staggering achievement for the pest management industry and for BASIS PROMPT, because we now represent over 50% of the technicians working in the sector and collectively, as an industry, we are in a very strong position with regards to demonstrating professionalism and currency of knowledge. “I think it’s fitting that Steve has been named our 5,000th member, because even though he is a relative newcomer to the industry, he has already recognised how being properly trained and staying up-to-date with the latest developments results in tangible benefits for his customers. Picture shows: Left, Steve Wilson, who works for Essex and Suffolk Pest Solutions, receives a bottle of champagne from BASIS PROMPT chief executive Stephen Jacob after he became the 5,000th person to sign up to the register. Error: Error validating access token: Session has expired on Sunday, 17-Feb-19 03:23:39 PST. The current time is Thursday, 18-Apr-19 22:08:33 PDT.